Central Pennsylvania is littered with trout fishing opportunities. All enter the playing field Saturday when the general trout season begins. Anglers will be covering the banks of nearly every trout approved water from Pittsburgh to State College to Harrisburg on up to Scranton, and everywhere in between. There’s so many waters to fish it can be a chore to pick a place. Meanwhile, we’ve found Standing Stone Creek to be a favorite of many. Located near Huntingdon the creek is roughly an hour and a half from Harrisburg, three hours from Pittsburgh and 30 minutes from State College. The Pennsylvania Fish & Boat Commission stocks the creek heavily, which keeps anglers coming back year after year. We filmed Pautzke Outdoors here last May with Steel City Anglers and found willing brown and rainbow trout. Golden rainbows are stocked, too. Early in the trout season last year Standing Stone Creek was running high and off-colored due to significant rain and high runoff. Visibility was fewer than a foot when we were there. Fortunately, those conditions aren’t predicted for Saturday’s opener. Anglers are likely to find more clear water, which is great news for those chasing the golden rainbows. The goldens will likely be found near culverts, bridges and along easily accessible spots. What we appreciated most about Standing Stone Creek is that it’s stocked over several miles of stream. This helps spread out the pressure. You’ll find fish along Standing Stone Road (Highway 26) from Huntingdon upstream. Beyond that, the creek is stocked anywhere there’s easy access or a bridge. Most of the stocking points are obvious. However, if this system is new to you download the Fish & Boat Commission’s App, which gives you exact directions to all stocking points. While there are browns, goldens and rainbows, we caught 95 percent rainbows last season. You should expect to catch mostly rainbows, too. All of our fish came on Pautzke salmon eggs. James Swearingen (of Steel City Anglers) literally caught and released a few dozen while filming Pautzke Outdoors in a few short hours. He’s been coming here for a decade and enjoys the system because of it’s gentle gradient and how easy it is to fish. All our trout were caught on Pautzke eggs. We fished with four-pound test, Water Gremlin BB split shots and drifted three eggs at a time under a Trout Magnet float. We used Gold Label, Pink Shrimp and Natural Deluxe eggs. In fact, I believe Swearingen used a bottle of each. He caught that many fish. Expect most of the trout to run 10-12 inches, but know much larger are available, just not the norm. This is a system packed with trout and many miles of public access. Editor’s Note: Pautzke Fire Bait will be given away by the PA Fish & Boat Commission at Standing Stone Creek Saturday. 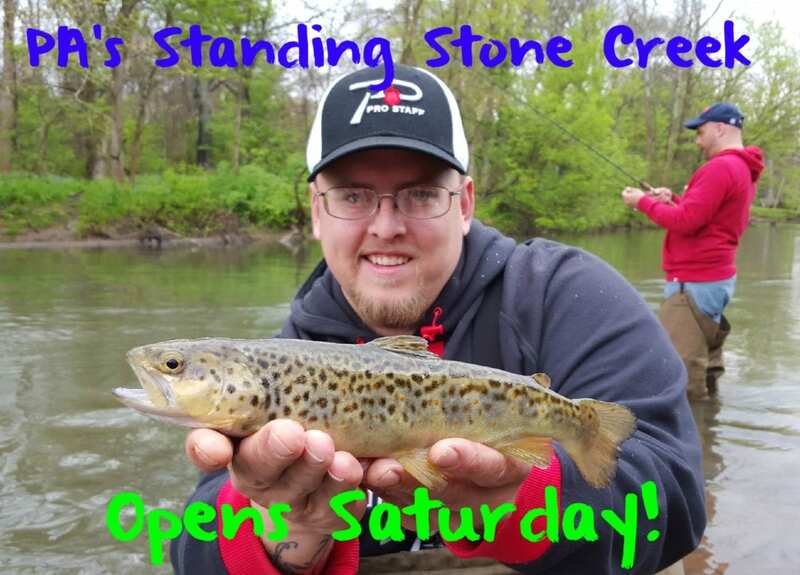 To watch the episode we filmed of Pautzke Outdoors at Standing Stone Creek click here: https://youtu.be/1Y1AM9gTJ0Y.